The Welcome Center was created to give families a streamlined enrollment process and provide an introduction to the district. After completing the online requirements, parents should call the Welcome Center to set up an appointment to finalize their child's registration. The Welcome Center is open year around. We encourage you to register your children as soon as you move into the Pickerington area. Enrollments for grades 1 through 12 for the 2018-19 school year will begin May 7, 2018. Information about registering for kindergarten or preschool can be found by scrolling down to the appropriate sections lower on this page. Please note: If you are not the residential/custodial parent or if you do not currently live in the district, you should call the Welcome Center at 614.920.6180 before beginning the enrollment process. The first step in the process is to identify yourself as an “existing” or “new” family in the district. Existing families are those who have a student currently enrolled in our district. These families should register students by logging into their existing Infinite Campus parent portal account. New families have never had a child enrolled in our district. “New” families should proceed by going to the online registration form. The registration process begins with parents filling out the online registration form. Upon completion and submission of this registration, you will receive a verification email asking you to call the Welcome Center to set up an appointment. Birth certificate (original or certified copy.) Children entering kindergarten must be 5 years old by August 1 of that school year to enroll. Proof of residence. For current residents, this is a mortgage statement or signed lease AND a current electric, gas, or water bill showing name and home address. For new residents, a mortgage settlement statement/loan disclosure or a signed lease is required. If you are living with a friend or relative, you must complete a Friends and Family Affidavit (PDF) | Friends and Family Affidavit (RTF). Custody documents, if applicable. (This may include a judge-signed, court-stamped divorce or dissolution document, and any shared parenting plan.) If you are not currently the residential/custodial parent, please call the Welcome Center at 614.920.6180, before beginning the enrollment process. Ohio law requires the entire custody document be on file with the school. Individual Instruction Plan (IEP) or Evaluation Team Report (ETR), if applicable. All preschool students must have an approval letter or email from the preschool. To balance class sizes across the district, it is sometimes necessary for a registering child to attend a different elementary or middle school than the one within his or her normal attendance area. If this happens, the district will provide transportation to the other school building. Students will be assigned to class openings on a first-come, first-served basis. Students will not be assigned to a classroom until all paperwork is received by the Welcome Center. Therefore, it is important to get all registration materials turned in as soon as possible. All requests for changes of address on school records must be submitted to the Welcome Center for processing. Residential address changes cannot be processed by a child’s school office staff or by Petermann Transportation. Any changes to a student’s home address must be requested on the district’s change of student information form. 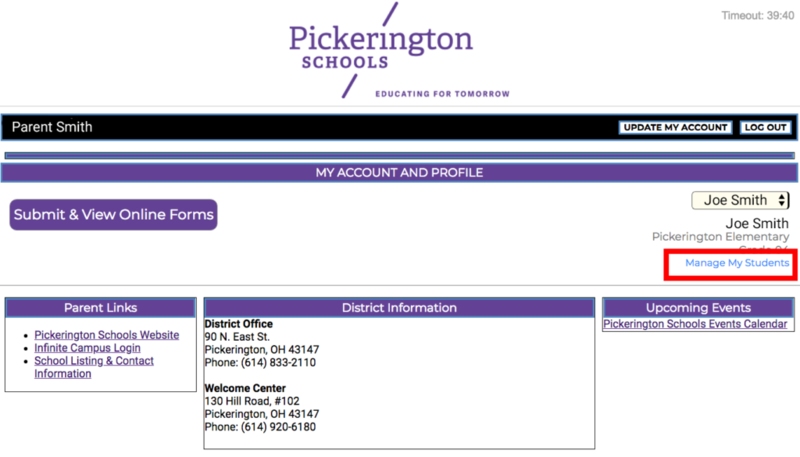 This form includes a standard authorization, to be signed by the parent, allowing for the release of residential and utility information to Pickerington Schools upon request, if necessary. This release also includes an explanation, per Ohio Revised Code, as to how it is determined where your child is to receive his/her tuition-free, public school education. By signing this release, you are also verifying that you have been informed of your legal responsibility to withdraw a child from school if you ever move outside school district boundaries. If you do not have the capability to print the form, contact the Welcome Center at 614.920.6180. We will be happy to mail, email or fax the form to you for completion. You also may pick up or return the form directly to the Welcome Center, rather than turning it in at your school office for intra-office transfer to us. This expedites the address change process. an open enrollment request has been completed, if applicable. This is necessary if a change of residence, made during the school year, causes a change in the student’s attendance area but the parent wishes to have the student finish the current school year at his/her current building. Such a request is only considered for the student’s continued attendance through the end of the current school year. Note that buses do not cross school boundary lines to accommodate open enrollment students. Parents are responsible for transportation. If the move has caused a change in the building the student is to attend, the involved school buildings are notified and the electronic and physical transfer of records takes place. Arrangements for the official start date in the new school can be made between you and the office staff of your child’s new school. The Welcome Center will notify Petermann Transportation of your change of home address. If bus service is available in your new area for your child, we begin the steps needed to arrange a new bus stop location “from and to” your new residence. Petermann staff establishes all bus stops and notifies drivers as quickly as possible. Your school building office staff will obtain all bus stop information from Petermann Transportation. If a new bus stop must be established at any point in the route where the driver does not currently make a stop, this process may take two to three days. If necessary, your child’s school office can issue a bus pass if your child must ride the bus before the change can be finalized by Petermann Transportation. This change of address procedure applies only to changes in the actual physical address where a parent and the student reside. A temporary change of bus stop location at a place other than the student’s home (for situations such as babysitting arrangements) may be accepted in the school office of the building where your child attends. A form requesting a new bus stop location (PDF) can be downloaded from Petermann Transportation. The Welcome Center does not handle these changes. The forms should be submitted to your child’s school office or faxed directly to Petermann Transportation. Access an RTF version of the Request a New Bus Stop Location form. If you are moving into the district, it may be possible to enroll your student in Pickerington Schools prior to your move. Under state law and board of education policy, the Pickerington Schools grants a period of 90 calendar days for you to physically move into the district. For enrollment, you must have a signed purchase agreement/contract showing you are purchasing a home in the district. The student will be withdrawn from Pickerington Schools on day 91 if you have not provided the Welcome Center with a settlement statement or loan disclosure. If you have further questions, call the Welcome Center at 614.920.6180. 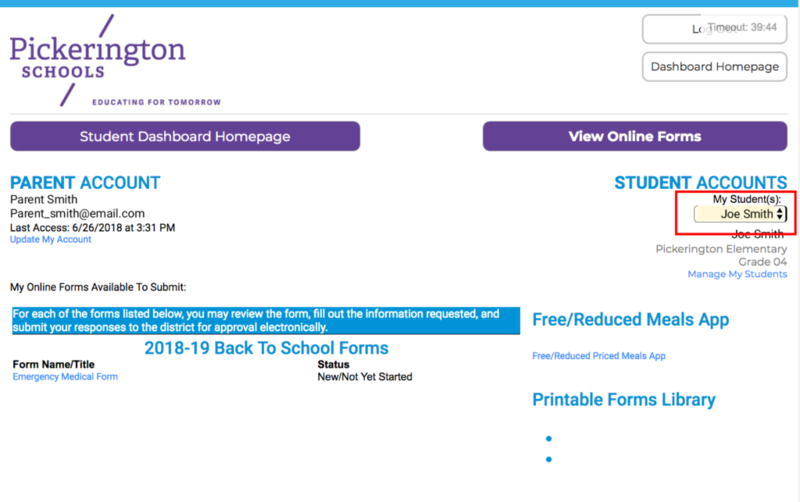 If you live in the district and are obtaining custody, residential rights, or guardianship through the court, you may be able to enroll your student in Pickerington Schools prior to finalizing the change. As provided for in state law and covered in board policy, Pickerington Schools has chosen to work with parents to get their children enrolled in school, in all cases possible. Pickerington Schools grants a period of 60 calendar days for parents to obtain the final, judge-signed document that legalizes the change. a legible copy of a photo driver’s license or state ID with photo belonging to the parent or guardian who currently has the right to enroll the student in school. The student will be withdrawn from Pickerington Schools on Day 61 if final legal documents have not been provided to the Welcome Center. If you have further questions about this law and/or board policy, call the Welcome Center at 614.920.6180. Kindergarten registration for the 2019-20 school year will begin online Wednesday, March 13, 2019. Children entering kindergarten must be 5 years old by August 1 of that school year to enroll. For more information, see Board Policy 5112. To start the kindergarten registration process, parents fill out the online registration form through Infinite Campus. This form will not be active for the 2019-20 school year until Wednesday, March 13, 2019. Existing families are those who have a student currently enrolled in our district. These families should register students by logging into their existing Infinite Campus parent portal account. If you do not know your access information, see the Infinite Campus information below. Please note that if you are not the residential/custodial parent or if you do not currently live in the district, you should call the Welcome Center at 614.920.6180 before beginning the enrollment process. Read and follow all directions carefully. Close applications and files other than the web browser you are using to register. Update your web browser to the latest version, or try a different browser. Registering with a tablet or smartphone is not recommended. After completing the registration online, parents will receive an email with information about contacting the Welcome Center to set up an appointment to sign final registration paperwork. Parents will register for an appointment for the Bracken readiness assessment at the time of the appointment. Parents may request a morning or afternoon kindergarten preference. A lottery will be held if necessary. To be considered for the lottery, all necessary forms must be submitted by May 1. Custody documents, if applicable. (This may include a judge-signed, court-stamped divorce or dissolution document and any applicable shared parenting plan.) If you are not currently the residential/custodial parent, please call the Welcome Center at 614.920.6180, before beginning the enrollment process. Ohio law requires the entire custody document be on file with the school. All incoming kindergarten students must have a completed kindergarten physician’s report form on file, including completed immunizations. These reports also can be obtained at the Welcome Center and must be turned into the child’s school by August 1. Parents are encouraged to contact their child’s school nurse to discuss any health concerns prior to the start of the school year. If you have any health-related questions, please contact Sharon Schmitz, RN, MSN (School Health Coordinator). The district administers the Bracken School Readiness Assessment for incoming kindergarten students. 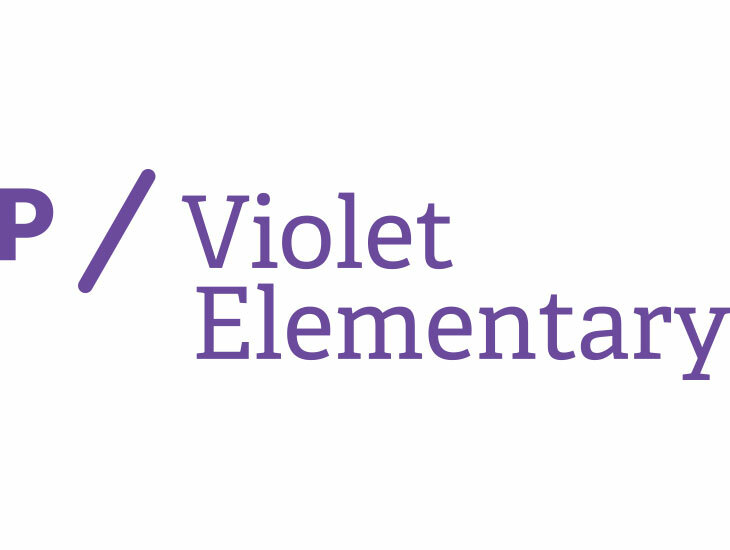 These screenings for 2019 will be from 8 a.m. to 8 p.m. April 29, April 30, and May 2 at Violet Baptist Church, 8345 Blacklick Eastern Road (S.R. 204). Parents can also set up times throughout the summer at the Welcome Center at (614) 920-6180. Parent meetings for incoming kindergarten students will be held at each building before the start of school in August. Watch the district website and social media for times and dates. Under state law and board of education policy, the Pickerington Schools grants a tuition-free period of 90 calendar days for you to physically move into the district. a signed rental agreement or a letter from a landlord or rental office stating your new address and your expected move-in date. We cannot accept an application for rental as proof of intent. The early entrance process assesses a child’s readiness for kindergarten and his/her intellectual and developmental progression relative to future success as the youngest student in his/her class in subsequent grades. The comprehensive process evaluates the aptitude, achievement, ability, interpersonal skills, and developmental maturity of the child. Early entrance is considered a grade-level acceleration and impacts a student’s entire academic career. For complete information about early entrance to kindergarten, visit our Gifted Services page under Early Entrance. The Pickerington Preschool is a program that enhances and encourages learning for children with disabilities and typically developing children. We welcome children ages 3-5 years of age, while offering a range of services free to children with a qualifying disability; typical developing peers are enrolled on a tuition basis. All children are provided with a typical preschool experience and the opportunity to interact with children of all abilities. Parents interested in applying for Pickerington Preschool begin the process by filling out the preschool application. Once this is submitted, you will be contacted by a Preschool staff member. Complete information about Pickerington Preschool is available on the preschool web pages. It is very important that an address be changed as soon as the move occurs. Both Pickerington Schools and Petermann Bus Transportation need the most up-to-date information to better serve our families. If the new address results in a school building transfer, it will take one to two days to process that transfer with the schools and Petermann. If the new address results in a school building transfer, but parent would like student to remain at current school, an Intradistrict Building Transfer Request form will also need to be completed for approval. Note: If the address change coincides with a custody change, the parent will need to submit custody documents as well. If you have questions or concerns, please contact the Welcome Center at 614.920.6180. 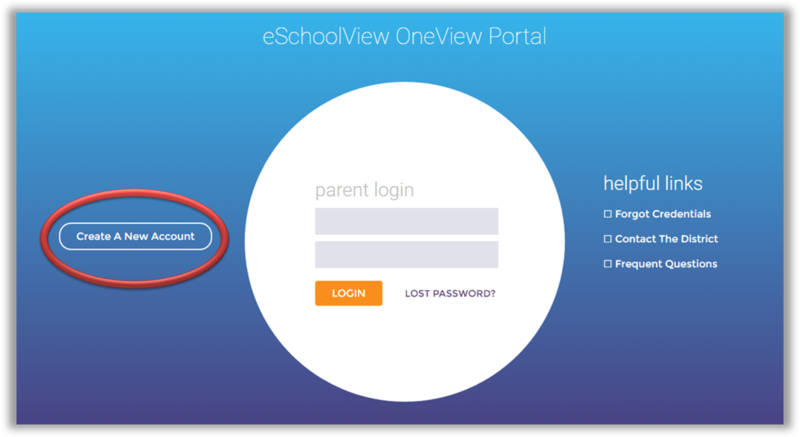 What Changes Can Be Made Through the Parent Portal? With the exception of address changes and student name changes (for which you should fill out the Change of Student Information Form), and custody updates (contact the Welcome Center), all other information can be updated using the Infinite Campus Parent Portal. This includes phone numbers, email addresses, family relationships, adding/deleting emergency contacts, etc. Parents submit their changes and updates on the Parent Portal, where it will be processed by a Welcome Center staff member. If you have a problem activating your parent account, the help request form can be found under “Getting Help” under Infinite Campus on the district website. Be sure to fill in all the fields. 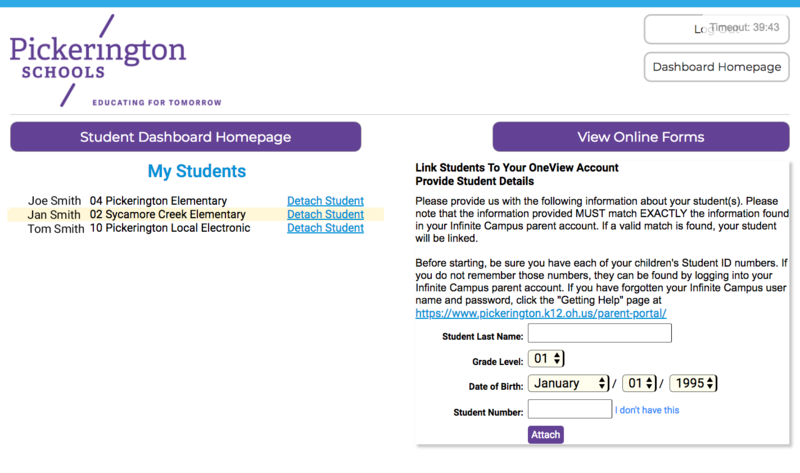 Your account will be activated by Pickerington Schools Technology Department personnel. 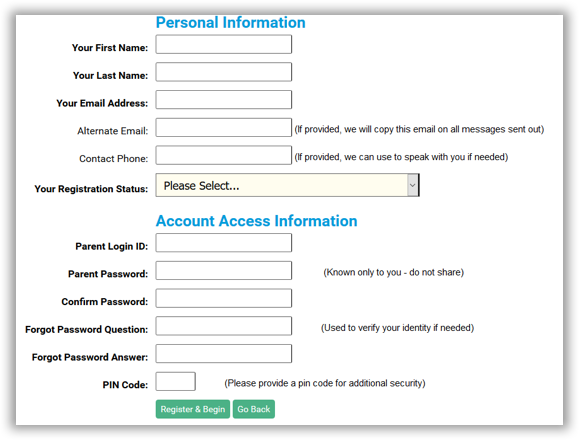 Your username and password will be emailed to you, along with other important information necessary to properly establish your account. Where is the Welcome Center? The Welcome Center is at the intersection of Hill Road and Columbus Street, at 130 Hill Rd South, Suite C, in Ridgeview STEM Junior High School. GPS does not recognize the address, but does recognize the name of the school. Here’s the best advice: Travel to downtown Pickerington until you get to the intersection of S.R. 256 and Hill Road. Ridgeview Junior High School is just south of the intersection, on the left. Do I Have to Come to the Welcome Center in Person to Make an Address Change? While all address changes must come through the Welcome Center so that both the school and Petermann Transportation are notified, there are other means of getting us the information. If the form is completed and proof of residency is sufficient, the documents can be faxed to the Welcome Center at 614.833.2114 or emailed to Cheryl Isaacs. We respect our families’ time and schedules. With that in mind, please call the Welcome Center first to see if a personal visit is necessary. The Welcome Center is in Ridgeview STEM Junior High School, 130 Hill Road, Suite 102, Pickerington, OH 43147. It is open year-round on weekdays from 8 a.m. to 4 p.m.
Take Exit 112-A/Pickerington (Cracker Barrel will be on your right). Go south on Hill road (SR 256), enter Historic Olde Pickerington Village at the railroad tracks. The Welcome Center will be on your left just after the traffic light at Columbus Street/SR 256. Go north on Diley Road, turn right on Busey Road. At the stop sign, continue east, turn left on Hill Road. Pass PHS Central. Ridgeview STEM Junior High will be on your right just before the traffic light at Columbus Street/SR 256. Pickerington students attend school on a neighborhood-school basis. That is, their “home school” is the one in the attendance area in which they are assigned as determined by school boundaries and approved by the Board of Education. However, board policy allows that, in conjunction with state law, students be given the opportunity to attend a school within the district other than the one to which they would regularly be assigned. Students who live in the assigned attendance area or are otherwise assigned to a building by the district administration get first preference over students requesting an intradistrict transfer. Second preference will be given to students who do not currently live in the assigned attendance area but were previously enrolled in a school building. It is possible for parents to request to have their children be considered to transfer to a different school than the one he or she typically would attend based on location of residence. If approved, transportation to the new school is the responsibility of the parent. Parents of children in grades K-6 must submit a request each year. Parents of children in grades 7-12 are only required to apply once. Details about intradistrict building transfer are provided through Board Policy 5113.01 and 5113.01 AG and on the intradistrict transfer request form (PDF) | intradistrict transfer request form (RTF).